E-Force has an eventful history which I'm not really going into. The company originated out of Hawaii. All pretty uneventful until it was sold to Ron Grimes and Company in roughly 1992-3. Ron was responsible for the development of Ektelon Racquetball 20 years before. He brought with him a life time of experience and many of the racquet engineers responsible for Ektelon's success. E-Force has a great research and development unit responsible for many of the new technologies outlined below. I was given the grand tour last time I was in town so I know these guys test thoroughly. E-Force is located at 2080 Las Palmas Ste 102 in Carlsbad, CA 92011. Their direct phone number is 1-800-4-E-FORCE. Any warranty issues can be addressed by them directly. Blinding velocity, a sharp crisp feel on contact! Hear the blast off the front wall . . . and see defeat on your competitor's face. New advanced, extremely stiff, yet incredibly light GC Power Fibers. GC Power Fibers are strategically positioned in the racquet frame among the TakeOver's over 50 carbon-graphite laminates. Stiffness is increased in critical areas of the frame creating greater power across the entire string bed. G2 Power Boosters - Patent Pending. The Second Generation of Hi-Octane Power Boosters® - enhanced and extended to further stabilize the stringbed and increase power for on and off center hits. In addition, ball control and accuracy is increased. The boosters create a solid hitting surface increasing the confidence of the player by turning the entire racquet into a hitting, power, kill zone. Under the paint and finish of E-Force performance racquets are approximately 50 individual graphite pieces and parts that are molded into a single structure using high temperatures and pressures. These graphite parts vary in many ways including: size,shape, stiffness, weight, graphite fiber orientation, fiber direction and graphite quality. E-Force designs each graphite part, employing these elements, to achieve the desired frame characteristics at each point on the frame. The E-Force engineering resultis a graphite structure in which every inch or segment of the frame is different and designed to provide optimum performance. Every year E-Force produces the most powerful racquets on the market and this year will be no exception. Theyve stuck with the same head shapes/weights of their previous years Command Flexs but added their new technology called Hi-Octane Boosters to the E-Force Heatseeker Series of Racquets. What are these Hi-Octane-Boosters going to do for your game? They create a more solid stringbed! They increase your overall power! They give you more power on off center hits! They increase shot accuracy and ball control! POWERHOUSE BREAKTHROUGH - In the past, all racquets had standard shaft lengths with whip and power. The introduction of 22" LongString Technology - available only from E-Force - changed racquetball withincreased power through the use of longer mainstrings in free space. Competitors responded by eliminating the racquet shaft and shortening the handle to allow slightly longer mainstrings, though far shorter than E-Force's. Now another breakthrough  E-Force combines the power of shafts with the power of 22" LongStrings in free space, for maximum power. Only E-Force has it. BY-PASS Stringing System - Power and livelier ball response. Mainstrings skip every two holes. The ball does not directly strike two adjacent mainstrings at once. Launch Pad Technology - Maximizes power. Eliminates unnecessary deflection-limiting cross-strings in racquet throat. Increases stringbed deflection. Recoil Power Edge - Larger stiffer cylinders in hitting area reduces twist/distortion. More stringbed deflection and power. Patented Extreme Longstring Technology - All mains and crosses are the longest possible  extend to outside edges of the frame and handle. Fiber Alignment (FAT) Zones - More strength and power in racquet head. Pushes out and aligns fibers in high-stress curved areas of frame. Total Carbon Head -Adds stiffness, durability and power. Paint and non-structural materials replaced with additional carbon graphite. 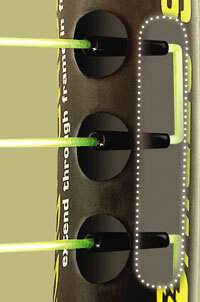 Patented Dual Cyclinder Construction - Ultra-thin, two-tube with bridge construction - longer strings, more power. Reduced frame twist and distortion. The Command Power Flex is a totally new engineering design - combining a stiff frame with a new flexible Power Shaft, and a complete arsenal of E-Force advanced technologies created just for racquetballOnly available in E-Force Command Power Flex racquets. Engineered to increase ball compresion on the hitting surface. The strings grip the ball more delivering a point scoring difference. Increased front wall pop and better feel. Off center hits are solid, vibration is reduced so you are more confident to take the shot. The Powerhouse Shaft increases the handle length by at least 2 inches. This decreases the drag on the racquet head which results in a much greater racquet head speed. The increased handle also decreases the overall sq inches of the head which results in greater control. Only E-Force (with their Longstring technology - hollow handle) could make this advancement truly work. This is the technology leap in racquet design for 2009. Larger stiffer cylinders in hitting area. Increases stiffness for blasting power and stabilizes frame for a more solid feel. Allows for longest possible cross-string that increase string bed deflection and power.! Two cylinder frame design in corners lead to the longest string possible and increase in power. They stabilize the head of the frame for a more solid feel and they help prevent twisting which leads to enhanced power and control. Compresses the frame with a never-before-seen and patented ultra-thin aerodynamic "Wing" shape with super-thick frame walls. The result is blinding speed on offense plus armor-like durability and quick flick maneuverability to play tight corners and unleash murderous power on balls glued to the walls. E-Force's Tyranny and Radium are made in a radical new way from two hand-laid carbon graphite tubes (instead of one) joined at the outside by a graphite bridge, creating a deep channel on the inner frame. What does this give you? The most power E-Force racquet ever created. E-Force's Tyranny and Judgement come in a traditional racquet shape. The quadraform design brings a little more control to the E-Force longstring design without sacrificing power. Those who have loved the Bedlam's of the past but needed a little more control. This might be the perfect racquet for you. E-Force eliminated the bottom four cross strings on what they call the Launchpad series. Power comes from increased string deflection. The Launchpad technology increases string deflection by 38.5% over the previous E-Force racquet line creating the most powerful racquets in the game. Launchpad string deflection and power are increased by a 3-part fin system, located in the throat of the racquet, that stiffens the frame and allows the elimination of deflection constraining cross-strings. You're probably saying, what has E-Force come up with now. These tubes come on their Judgement racquets from 2001-2002 and on all their new Launchpad Judgements and Bedlams for 2002-2003. It's their own built in vibration dampening system. These flexible tubes in the handle individually dampen 48" of the mainstrings. On the 2002 line, the main-strings skip two holes so therefore the ball never strikes two directly connected mains. It creates a livelier ball response and longer string life. Full-Motion String Technology with New Extra-Large String Holes.. It's the same principle at the bow and arrow. For an equal amount of effort, longer mainstrings and racquet face cause the strings to stretch further, allowing the frame to store more energy. The result is a string/frame system which provides a more powerful shot when energy is released. This technology extends the effective length of the cross strings and allows them to move unrestricted 360 degrees in free space. This overcomes the string-binding effect of the standard-size string holes or slots, and creates a livelier string bed with maximum power at ball impact.. The Total Carbon Head provides 20% more carbon in the head for additional stiffness, durability and increased power. Streamlining the bumper and eliminating paint allow non structural materials to be replaced with Tri-carbon. The result is improved performance without adding weight. Fiber Alignment Technology (F.A.T.) Zones strengthen and stiffen the weak areas found in the sharply curved regions of all racquet heads. Patent-pending F.A.T. Zones realign the unseen bunched and wrinkled carbon fibers present in these high-stress areas, strengthening and stiffening the frame, and adding power.. The Tri-Carbon Frame is an optimum blend of 3 Toray higher-stiffness, minimum-weight carbons. It increases stiffness in the racquet head and frame - without adding weight - resulting in greater LongString power and feel. Titanium Construction increases strength and durability without adding weight or reducing maneuverability. Faster swing speed and quicker reactions allow you to set up better and hit the ball harder.. The Control Wrap found on the Revolt racquets increase control and minimize vibration without the loss of LongString power. E-Force accomplishes this with an exclusive new one-piece fin/frame design that increases stability and prevents distortion from off-center hits. Ball response and power are enhanced.